Production Schedule Loader allows to create, update and explode production schedules in QAD. It provides users with an efficient interface for maintaining schedules and allows comparison of scheduled quantities with net requirements. Production Schedule Loader gives flexibility of maintaining schedule in 28-days or 28-weeks horizons (or both combined) and is equipped with MRP drill downs and Net Requirement calculation. Production Schedule Loader can only be used by users with valid QAD User ID and password and access to 18.22.2.1 Schedule Maintenance menu in QAD. User Authentication is based on native QAD Authentication logic (user id, password, menu and site security). Every time user will open Production Schedule Loader template and at the first attempt to connect to QAD database to upload or download information he/she will be required to enter QAD user ID and password. After opening a loader user should click on Setup button to specify what QAD database Production Schedule Loader template should be connecting to. In the pop-up window select a database and click on Select. Note: If required database is not in the list, please contact IT department. Connection needs to be setup only once, after opening the template, unless user will need to switch to a different database. If template is saved after database selection, connection step could be skipped next time loader is opened. Information about QAD database user is connected to will be always displayed at the top of the template header. Note: always verify database connected before making changes to it. 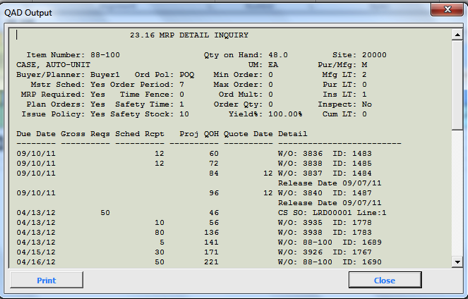 To download production schedule from QAD database user will need to specify selection criteria in the header. Header selection criteria related to production schedule download include range of Item Numbers and Production lines, Site, Planner code and Start Date. Once selection criteria are specified user will need to click on “Download” button. First time user connects to a database after opening a template QAD login prompt will show up. User will need to enter QAD user ID, password and database domain name (if applicable). User will need to have access to 18.22.2.1 Schedule Maintenance menu in QAD to be able to upload and download data using Production Schedule Loader. If user authentication is successful production schedule will be downloaded into Excel. Prior to download user should specify start date for the schedule in the header selection criteria. First date of downloaded schedule is always shifted to Monday, even if specified start date does not fall on Monday. Scheduled quantities, shown as a result of download, are open scheduled quantities, calculated as quantity required minus quantity completed. If quantity completed exceeds quantity scheduled, negative (overschedule) quantity will be displayed. Total open quantity for the dates before the first schedule date is displayed in Past Due/Over column. Note: We recommend deleting past schedules using 18.22.2.7 Schedule Delete in QAD. Otherwise, quantity reported as complete on a certain date might not correctly offset quantity scheduled for that date, because QAD automatically applies quantity complete against first open scheduled quantity. Production Schedule Loader allows to create new or modify existing schedules in QAD. When creating new schedule or modifying existing one user can first download schedule from QAD and use it as a template. User can also compare existing or new schedule with net requirements or look into detailed MRP report (see details for Net Requirements Comparison and MRP Details Inquiry options below). Once all scheduled quantities has been entered and reviewed user will need to click on Upload button to create/update production Schedule in QAD database. Before attempting to upload data into QAD database Production Schedule Loader will run data validation. If it encounters any errors message “Error occurred!! !” will be displayed in Status window and colour of cells with invorrect values will be changed to red. Each red coloured cell will have comment attached to it with details of the error. Once all errors are fixed user will need to click on Upload button again. 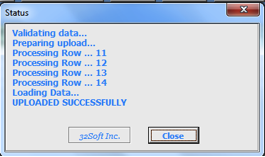 If data upload is succesfull message “Uploaded succesfully” will be displayed in Status Window. Note: Scheduled quantities, shown as a result of download, are open scheduled quantities, calculated as quantity required minus quantity completed. Similarly, when upload happens, Production Schedule Loader assumes that quantity specified in Excel is an open quantity. It adjusts quantity that goes into QAD for quantity completed on that date, if there is any. For example, scheduled quantity for 04/20/12 is 36, completed is 14. Open schedule quantity in Excel will be 36-14 = 22. When user clicks Update button without changing 22, Production Schedule loader will identify that completed quantity for 04/20/12 is 14 and record scheduled quantity for that date as 22 + 14 = 36. Production Schedule Loader allows user to compare existing or new schedules with net requirements. To trigger net requirements calculation user will need to click on Net Req button. Click on Net Req button will generate new “demand” tab with net requirement for all manufactured items (Pur/Mfg code is = “L”, “M” or blank) that match selection criteria specified in the header. In Production Schedule Loader user has an option to include or exclude safety stock from net requirements by switching parameter “Include Sfty Stk” to “yes” or “no” in the schedule header selection criteria. Net requirements are always adjusted for nettable quantity on hand. For example, there is a sales order for 10 EA due on 04/20/12. Nettable quantity on hand for the item is 12 EA. These 12 EA cover 10 EA required by sales order, so net required quantity reported will be zero. Production Schedule loader also takes into account safety time and manufacturing lead time when calculates quantities net required dates. It allows to efficiently compare net required with schedules quantities. For example, sales order is due on 04/23/12. Manufacturing lead time for an item is 2 days and safety time is 1 day. Net required date will be calculates as 04/23/12 – 3 = 04/20/12 and will show that quantity needs to be scheduled on 04/20/12 (instead of 04/23/12) to meet sales order due date. Calculation of net required quantities automatically triggers comparison of production schedule with net requirements. This action updates schedule tab and higlights in yellow scheduled quantities that are less than net required quantities. It also displays on the schedule tab items that do not have production schedule in QAD. These items are displayed without production line assigned. All yellow colored cells have comments attached with details of schedule and net requirement comparison. These comments are for informational only. User can take them into account and modify schedule or proceed with upload of original schedule. Production Schedule Loader allows user to maintain schedule using 28 days and/or 28 weeks horizon. There are separate tabs in the loader: Daily – for 28 days horizon and Weekly for 28 weeks horizon. When schedule is maintained using Daily tab (and 28 days horizon), quantities are schedules for a specified date. When schedule is maintained using Weekly tab (and 28 weeks horizon), quantities are schedules for Mondays only. Note: It is recommended to use different start dates for Daily and Weekly schedules. For example, current date for daily schedule and current date + 28 days for weekly schedule. Downloading weekly schedule for first 28 days of planning horizon and uploading it back into QAD will re-write daily schedule and shift all scheduled quantities to Mondays. Production Schedule Loader allows user to run schedule explosion directly from Excel by clicking on Schedule Explode button. Schedule explosion creates material and work center operation requirements. Until exploded, changes to the schedule are not reflected in components demand or work center load. Results of schedule explosion are displayed in pop-up window and can be printed. If schedule is not exploded from Production Schedule Loader, it will be automatically exploded during next MRP run or when user will run 18.22.2.4 Schedule Explosion in QAD. Exploding schedule creates in QAD scheduled work orders for each day of production. These orders are identified by work order type S (scheduled) and status E (exploded). Like standard work orders, they have an attached work order bill and routing and create component demands for MRP and work center load for CRP. MRP Detail Inquiry is displayed in a pop-up window. Date function in Production Schedule Loader allows to populate header dates based on the Start Date specified in the header. First date of the shchedule will be always shifted back to Monday for the week Start Date falls into. This function helps to identify error on the spreadsheet. When data validation is performed error messages are returned to Excel and recorded as cell comments for cells where error was found. Click on Error button will move cursor to the next cell with error, so user won’t need to scroll up/down a spreadsheet looking for errors. This function will delete data from a spreadsheet. Here is an example of spreadsheet before a click on Clear button. And here is how it looks after user clicked on Clear button.